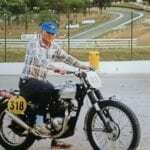 Having been involved in preparing, racing and restoring vintage motorcycles for something like seven decades, Archie Beggs has plenty of tales to tell. When I visited Archie towards the back end of 2017, at the home he shares with wife Joyce, he was playing with a side-valve Sunbeam Lion, registered in 1938 and one of the last Marston (so just pre-AMC takeover) Sunbeams. The Beam is now fitted with a Model 9 (the 500cc overhead valve model) cam; on a Lion, the inlet valve normally opens at top dead centre (TDC), but now is opening 15° before TDC. Archie explains all this with a mischievous glint in his eye, revelling in the prospect of what might be mistaken as an ‘old plodder’ going a bit better than might be expected. Archie was also in the process of making fork links; he explained, they were “nearly right” but will try until they are right. He also reckoned this was one of the last Marston Sunbeams ever built – and Archie will forever be associated with Marston Sunbeams. But he didn’t begin Beaming. He started with an aged 172cc Super Sports Francis-Barnett, a machine worn out in every way, which featured a bolt-up ‘built like a bridge’ frame. “I got a back wheel puncture and the whole thing looked like a blown up umbrella,” he chuckles. He adds it was also the only bike he ever had which had two chains fly off in one day. 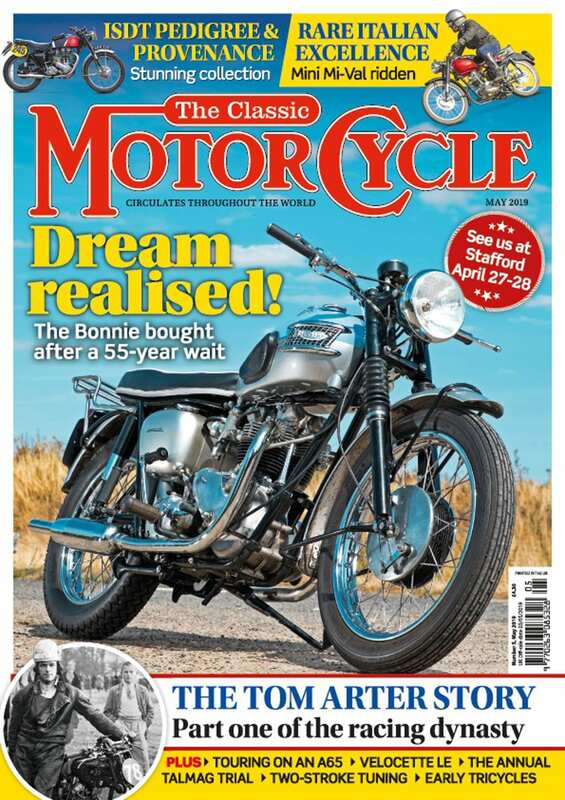 The Villiers-powered Barnett was replaced with a 600cc side-valve Douglas, which remains “the smoothest bike I ever owned” though he also notes it was also a sidecar tug, really. Archie’s brother wanted such a device so a deal was done, with an ageing long-stoke MSS coming Archie’s way in return. He started rebuilding that in the front room. Now he had the Velocette as well, Archie decided to keep the Model 90 purely for sidecar racing, often with his sister Kitty in the sidecar. “She was keen to do it,” he says, making sure that I don’t think he’d coerced her into it. There was 10 years of racing the sidecar on the sand, at the same time as racing the Velo as a solo. 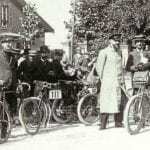 By now, the Sunbeam was running on dope and as the Velo was developed and getting faster, that was swapped over too. Next, a dirt-track Douglas was added to the stable, while Arche was also getting apprehensive about his sister being his passenger, so he had a change of tactic. Archie discovered the Douglas flat-twin sidecar outfit much to his liking, and would favour it on tight tracks, as the low centre of gravity meant it ‘drifted’ nicely. 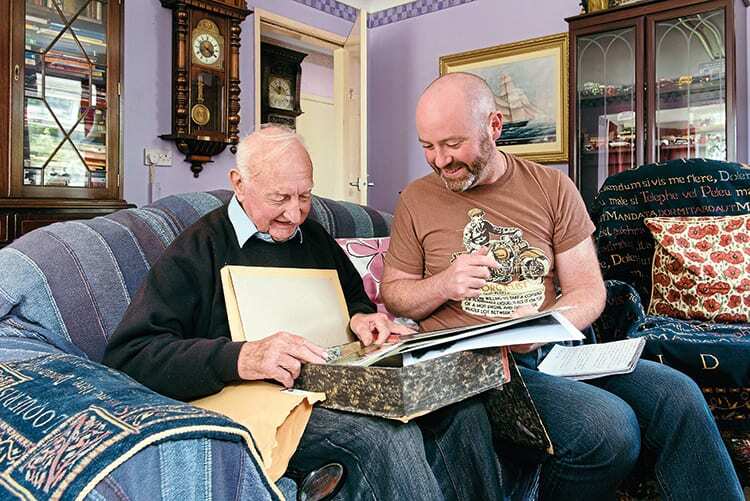 He was now taking part in lots of vintage racing, at places such as Church Longford, Cadwell Park and the Oulton Park club circuit. “We got the Douglas going well, and I could change gear (left-handed) across the tank,” he remembers. “It’s the same bike that Kenny Crawford rides now. I gave the sidecar away so I wasn’t tempted to have another go again,” he grins. I’m pretty convinced that’s the truth, too. 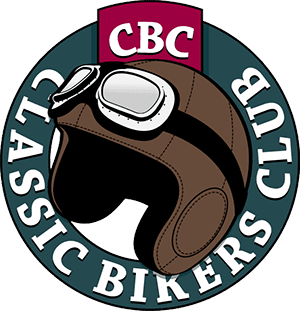 By now, a 500cc Rudge had also joined the racing line-up, complementing the Velo for solo class racing, with the Douglas for sidecar events, and the Sunbeam too. The Sunbeam was fitted with a four-speed box though Archie explains in sand racing it was “two straights with markers at both ends”. Among the competition on the sand was the remarkable Blease-JAP, as well as all sorts of other home-made creations and developments, including a dual-engine Rudge outfit. It all looked great fun. Though he enjoyed the other marques, it’s Sunbeams which Archie gradually became ever-more associated with. A second Model 90 joined the original one, and soon more Sunbeams, with a pair of flat-tank 9s (the ‘cooking’ 500cc overhead valve model once the 90 was launched in 1927) coming along too. Archie explains some differences between a 9 and a 90 – the 90 had a TT carb, close ratio gearbox, dry sump – whereas a 9 was more basic, still with total loss lubrication. But Archie says: “A good flat-tank 9 is better than a bad 90.” So there’s not much difference between them. He also explains how the 9 frame is kinked to go around cylinder head, so different to the side-valve frame, though when Sunbeam swapped to saddle-tanks – in 1929 – sv and ohv frames were the same. 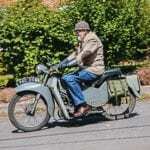 As well as all the others, there was also a pair of JAP-engined SS100 Brough Superiors. How did they come about? “Well, by the early 1970s, the 500cc Dougie was getting outclassed in sidecar racing, so I got hold of the 1927 Brough, then the 1929 followed it. The 500cc Douglas was better than the 600; the bigger engine was a road one really, the 500 a proper racer. We did as much as we could to keep the Dougie competitive. It was fitted with Vincent forks and dual brakes at one point. How did you transport the raceware to track? 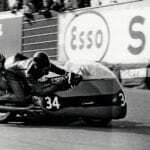 “When we were racing the bike was in the trailer box, the sidecar was transported down separately then once at the meeting we would put them together. Earlier on, when sand racing, we would simply tow the outfit down. 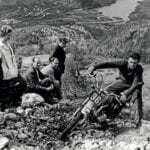 Archie confesses he had a love/hate relationship with his Rudge. It went very well and was cost effective, but he felt it was a bit crude and built to a price. For example, the girder forks were made of D-section tubing, rolled and brazed together. He recounts falling off the Rudge and bending the frame, though frame lugs were stamped and brazed, so wouldn’t break. It required a little bit of ‘hot’ straightening. Talking of bending, Archie points to the big, sturdy oak tree outside the window of his living room. In fact, the tree was also used to pull the whole racing sidecar outfit straight. I asked Archie why he’d never chopped and changed bikes. “Once you get them going right, why change?” is the totally logical, commonsense answer. Nowadays, and for at least the last 10 years, riding is left to Kenny Crawford, a sand-racer of old who Archie has known for years and who he describes as “… a desperate rider!” Which, I think, is meant in a complimentary way.